Lacking an “h” in his first name was one of many differences between Cris Carpenter and the successful Cardinals ace of the similar name, Chris Carpenter. Still, there was a time when Cris Carpenter was regarded as a top talent in the St. Louis system. Cris Carpenter was a first-round pick of the Cardinals in the 1987 amateur draft. The Cardinals took Cris Carpenter out of the University of Georgia as the 14th overall selection, ahead of other No. 1 picks such as the Astros’ Craig Biggio (22nd overall), the Orioles’ Pete Harnisch (27th) and the Tigers’ Travis Fryman (30th). After the draft, Cris Carpenter spent the summer of 1987 pitching for Team USA in the Pan American Games. He was 6-1 with five saves and a 1.37 ERA. He signed with the Cardinals in September 1987 and reported to the Florida instructional league. 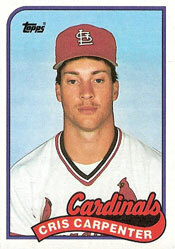 Cris Carpenter began his first professional season as a starter for Class AAA Louisville in 1988. After seven appearances for Louisville, he was called up to the Cardinals and given a start against the Braves in his major-league debut on May 14, 1988. The Braves were the boyhood favorite of Cris Carpenter, who grew up in Gainesville, Ga. In five years (1988-92) with St. Louis, Cris Carpenter was 21-15 with a 3.66 ERA, primarily as a reliever. Under manager Joe Torre, Carpenter was 10-4 with a 4.23 ERA in 59 relief appearances in 1991 and 5-4 with a 2.97 ERA in 73 relief appearances in 1992.